You Should Write For Contexts! If you could have the public’s attention for a moment, what would you tell them about our education system, teaching, and/or learning? Contexts, the ASA’s sociology magazine, is looking for people like you to write for our teaching and learning section. Your article can be about any topic related to education (Pre-k-12 & higher ed) and/or teaching and learning in general. Each article is only 1,500 words long and we don’t use jargon, footnotes, or citations. “How can I get started on social media? Who should I follow on Twitter? What blogs should I be reading?” I must have heard some variant of those questions two dozen times at ASA this year. That will probably sound strange until I tell you that, I was an instructor for the JustPublics@ASA Media Camp Pre-Conference Workshops. As always, I’m here to help. Below are some suggestions for sociologists looking to dive into social media. Want a pdf version to email a friend? Here ya go. First, you should check out the JustPublics@ASA Media Camp Workshop website for the handouts, resources, and best practices given out at the pre-conference workshop. You should follow people who are tweeting about your scholarly area of interest. That was the advice that Tressie Mcmillan Cottom, my Media Camp colleague, had for her workshop attendees. I’d echo that. The value of twitter is it’s ability to bring you people and information related to the things that interest you. That said, if you’re looking for a list of sociologists active on Twitter, you could do a lot worse than the list that Rosemary F. Powers created on her webpage The Paradox of Society. What Blogs Should I Read? Below are all of the sociology blogs that I can think of. I’m sure I’ve left some off. This list has a clear bias toward the U.S., but I’m not up on sociology blogging outside the states (though I would like to be). Email me if you’ve got a blog you’d like me to add. The article below originally appeared on SociologyToolBox.com and was written by Todd Beer an Assistant Professor of Sociology at Lake Forest College. Systematic racism has been made evident again in the shooting of an unarmed young Black man, Michael Brown, by a police officer in Ferguson, Missouri. Pulling stories directly from recent news headlines is one way to get students’ attention and demonstrate the abundant relevance of the sociological perspective. The New York Times has a timeline of the events that serves as a useful starting point (from the mainstream media) to share the events with students that may have not kept up with the story. The community of Ferguson, Missouri (the site of the shooting) has responded with on-going mass protests. Ferguson cannot be understood in a vacuum. These events are rich with sociological issues – inequality and poverty, racial profiling, the militarization of the police, protester and police interaction, social media (#Ferguson and hashtag activism) and the “criminalization of Black male youth”. “But Ferguson has also been home to dramatic economic changes in recent years. The city’s unemployment rate rose from less than 5 percent in 2000 to over 13 percent in 2010-12. For those residents who were employed, inflation-adjusted average earnings fell by one-third. The number of households using federal Housing Choice Vouchers climbed from roughly 300 in 2000 to more than 800 by the end of the decade. The community of Ferguson, one of many that have been disproportionally hurt by the economic downturn, has experienced long term poverty, and this undoubtably was part of the mass frustration that contributed to the emergence of the protests. See Brookings web site for their full story. However, the key grievance that seems to have inspired mass protest is the relationship between the police and the community. In previous posts I have explored the disproportionate number of Blacks incarcerated, arrested for drugs, and racially profiled under programs such as “Stop and Frisk”. While the population of Ferguson is 63% Black, 90% of the police officers are White. As noted by the New York Times (see below), Blacks in Ferguson are disproportionally stopped and arrested by the predominantly White police force. An FBI and federal justice department investigation is on-going and reports of the events present conflicting stories – an eye witness that was with the victim at the time says Michael had his hands up, but slowly emerging (which certainly adds to the distrust) police accounts argue that an unarmed Michael was in a confrontation with the officer. The job of the police is to make arrests and allow a court system to decide guilt. The police later released images from a video of a suspect robbing a convenience store (no weapons were used). Let’s just say it was Michael (that would still have to be proven). A police officer should be able to subdue a suspect without shooting him six times. In essence, (presuming guilt instead of innocence) Michael was sentenced to death for supposedly stealing a handful of cigars. The police responses to the protests in Ferguson have exposed the results of the militarization of municipal police forces. Images of police in full military gear, helmets, armored vehicles, sharp-shooters, high caliber weaponry, and military fatigues certainly garnered the attention of the media. The distribution of military weaponry to local police departments began after the terrorist attacks of September 11th under the guise of preparing communities for foreign attacks. Now we see this weaponry and accompanying tactics used in our own communities. The saying, “If all you have is a hammer, everything begins to look like a nail” comes to mind. This weaponry has been widely distributed. Click on the map above to have students go to an interactive version that allows them to see the distribution of the weaponry in their county. For example, I can see that in Cook county, home to my city of residence, Chicago, the police have obtained over 1200 assault rifles and even three “mine resistant” vehicles. In it they report the increased use of SWAT tactics for search warrants for low level drug investigations and that the “militarization of policing encourages officers to adopt a ‘warrior’ mentality and think of the people they are supposed to serve as enemies” (p.3). These tactics and mentality have resulted in the deaths of innocent people, including infants and children (see the report for numerous stories). Do these tactics pay off? According to the ACLU’s research, the majority of the time they do not. Drugs are only found about a third of the time. And these tactics are used disproportionately in cases involving racial and ethnic minority suspects. So, was this an isolated event among two individuals – the officer and Michael Brown? No. Sociologically, the impoverished community context likely leads to community members feeling disconnected from the rewards of mainstream society, the stereotyping of Black males as “thugs” and criminals likely added to the officer’s fear of Michael and activated socially constructed cognitive cues of “danger”, the community’s response is generated by local and national racial profiling by the police and a lack of minority representation among the officers, and the type of police response to the protests was a result of the militarization of the police driven by the “war on terror” and the power of the military industrial complex in our economy (and foreign policy). Recent Gallup survey results show vastly different perceptions of the police. These are not skewed by the events in Ferguson as the data is from 2011-14, but they certainly explain some of the resulting protests. Below is a link to a good article on the challenges and weaknesses of the data on the number of people killed by police each year. It’s great to inspire critical thinking about facts. For more excellent resources like this, please check out Todd Beer’s SociologyToolBox.com. Ready or not ASA is upon us. For those of you who are pedagogically inclined, I’ve put together a list of events that you should check out. Mostly these are the ASA Section of Teaching and Learning events. If you spot other sessions/events that I should feature, email them to me at Nathan@SociologySource.org. I’ll be tweeting from a lot of the sessions and I hope to see you at our Sociology Blog Party on Saturday at Johnny Foley’s Irish Pub. For more on the blog party check here. Reception, co-sponsored with AKD at the Parc 55 Hotel (room not assigned yet) with cash bar. Section on Teaching and Learning in Sociology Paper Session. Capstones, Culminating Experiences, and Senior Seminars: Meaningful Teaching Ideas that Help Students Put It All Together. Are you coming to ASA? Do you like chatting with friendly sociologists? Would you like to meet your favorite blogger face-to-face? We’ll then come on down to Johnny Foley’s Irish Pub and join us for the 3rd Annual Sociology Blogger Party. This is a casual and fun affair open to anyone. Your favorite bloggers from the Sociological Cinema, Sociological Images, The Society Pages, Conditionally Accepted, SociologySource, and SociologyInFocus will all be there. WHO: Open to everyone! Please bring your friends and colleagues. I want my students to see that social change isn’t magic. That it is a social process directed by social forces. I want them to know that previous historical events often serve as antecedents to change. And finally I want them to experience how learning about the past can help us better understand our present and predict our future. These are the goals I set for myself every time I teach my Social Change class. I pair these with the goals I have for every class I teach. For instance, I always want my students to learn about the scientific method, how to find and read peer-reviewed research, and how to write like a sociologist. Lastly, I want my students to develop the skill of creatively solving interesting problems because that it what they will be doing every day of their professional career. I always tell my students, if a question can be answered with a google search, no one will pay you to answer it. Everyone tells us to align our teaching goals with what we are doing in the classroom and with the graded assessments. That is excellent advice and I think it’s safe to say we all aspire to have our goals, classroom activities, and assessments aligned. However, in reality it’s really hard to get all of your ducks in a row. This semester I worked really hard to ensure that my student learning outcomes (SLOs) aligned with the written papers I assigned my students. Today I want to 1. give everyone a copy of my assignments and 2. discuss how I worked to get my goals and my assessments in line. Analyze a social change event using sociological concepts/tools like social/historical contexts, social structure, sociological theory, materialist/idealist factors, etc. Answer a social change research question using peer-reviewed research. (aka think and write like a sociologist). Design a Direct action campaign to alter the power relations surrounding a social issue (aka creatively solve interesting social problems). 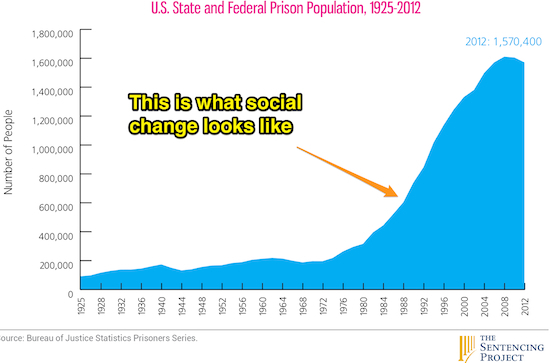 I decided to focus my class around one single example of social change: mass incarceration. I had my students read the first 2 chapters of Michelle Alexander’s The New Jim Crow. Alexander (2010) is making a clear argument that the War on Drugs (WoD) policies have recreated the racial caste system that has been with the United States since slavery. She walks the reader from slavery to vagrancy laws to Jim Crow laws to WoD polices arguing that each instance was a mutation of the prior system of oppression. I ask my students to write down all of the social antecedents they see in the assigned two chapters. Then we worked together to create a list of antecedents (download here). The next day in class I draw a big time line across the double-wide white board at the front of the room. We worked together to fill the timeline with all of the crucial events and other social antecedents. With their antecedent list and timeline in hand, I have my students apply everything we’ve learned about social change from the rest of the class to the WoD and mass incarceration in paper 1. One of the key ideas of social change is that if something hasn’t changed yet, then it’s probably because somebody else doesn’t want it changed. That’s my one sentence summary of Darhendorf’s (1959) Class and Class Conflict in Industrial Society. Really what we’re talking about here is hegemony and the social forces that maintain the status quo. I want my students to be able to identify those on each side of the WoD issue. I also want my students to develop their skills at doing literature reviews and using empirical evidence to support their arguments. Paper 2 combines both of these into a simple research paper. What good is knowing how things change if you don’t learn how to create some change yourself along the way? The book Organizing for Social Change is a workbook that guides you step-by-step through the process of fighting for social justice. The first two chapters explain what direct action organizing is and then the rest of the book is a series of worksheets and tasks to get your activist campaign off the ground. In paper 3 my students are challenged to plan a direct action campaign to mitigate the consequences of the WoD polices and mass incarceration in general. While it might sound like I am enjoying their anguish, in reality I don’t. But I know that frustration, anger, and exhaustion are all common side effects of learning. Too often writing assignments are paint-by-numbers style activities. Students have grown accustomed to being told exactly what to write about, so open assignments like this give student the opportunity to creatively solve interesting problems.